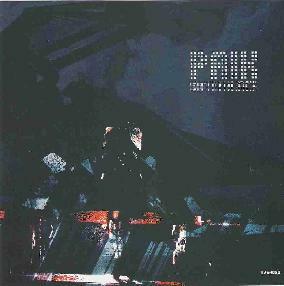 Space rockers Paik may be following in the footsteps of such noise excursionists as My Bloody Valentine and Sonic Youth, but this band throws out the song format entirely, opting instead to create monstrous, heavy jams of deep plodding rhythms and sludgy, hissing, vaporizing sheets of groaning chaos. Through the turbulent morass of guitar, bass, and drums, faint melodic textures emerge, quickly sinking back into the ocean of sound. The instrumental trio of guitarist Rob Smith, bassist Ali Clegg, and drummer Ryan Pritts plot a course through a churning, swirling storm of noise on their 4th and latest album, Satin Black. But Paik chart the realms of a vast chunk of space indeed, a journey that takes them from the more earthly and gritty urban spaces of their hometown of Detroit in Dirt for Driver to the frontiers of vertiginous space sickness in Dizzy Stars. Along the way, they navigate sonic squalls of fuzz-drenched clamor such as the 7 ½ minute Jayne Field and the nearly 15 minute long voyages of the epic title track and the rhythmless sea of feedback album closer, Stellar Meltdown En El Oceano. You’ll pretty much have to be totally into that wall of feedback kind of sound to get into this album, because it’s completely uncompromising. With no real solid structure to it, there’s nothing to anchor oneself to. You’ll just find yourself floating, but this is no sea of tranquility that you’ll be carried away on. Satin Black, by its very nature, is not really an easy listen, and sometimes it tends to get a little mind numbing. Then again, if you’re in the mood for a good mind numbing, it’ll certainly do the trick. For more information you can visit the Paik web site at: http://www.beyonderrecords.com.